Installing reflective striping along the top edge of your Boston Whaler will make you and your boat much more visible to marine traffic. Also, when being trailered the tape makes you visible to automobile and truck traffic. Imagine having your beautiful little Whaler parked in a lot and having someone turn the corner and head right for your boat and trailer. A simple strip of reflective tape would make your rig visible to even the most distracted driver. 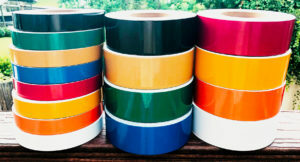 There are several choices for tape. The least expensive and most versatile is going to be a flexible engineer grade. 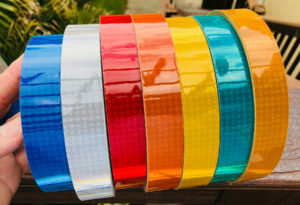 It comes in the most colors and is perfect for marine applications since it is only one layer and will not delaminate. A 1 or 2 inch roll is all you need. This material is very flexible and easy to get to conform to curves. It feels the same as what electrical tape would feel like. Only very bright and reflective. A second and even brighter choice would be a V82 Oralite tape. It is going to be about 8 times brighter than engineer grade. Since it will not stretch it would need to be applied to a flat, smooth surface. V82 is just like a SOLAS tape but in colors. Both of these tapes are a single layer design and will not delaminate making them perfect for marine environments.